Thailand was known for centuries by outsiders as Siam. It first made a real impression on the West at the end of the 17th century, through the reports of a series of inquisitive Frenchmen. They were not the first Europeans to spend time in the kingdom, however. The Portuguese sent an envoy to the capital in 1511, shortly after they seized Malacca. The Portuguese joined resident Chinese, Japanese, Malays and Persians to make the Siamese capital one of the most cosmopolitan cities in the vast region now known as Southeast Asia. Modern and predominantly Buddhist, it is a Southeast Asian kingdom whose ancient equilibrium and present standing mingle in evolving harmony. Substantially, Thailand�s distinctive and unparalleled characteristics stem from Indian and Chinese influences (harmoniously blended by Thai eclecticism), rich ethnic diversity, abundant natural and human resources, and over seven hundred years of cherished independence (Thailand is the only important Southeast Asian society never to have been colonized by Westerners). 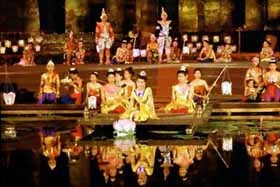 Thailand�s traditional culture is delicately tuned to the time-honored Buddhist�s non-confrontational approach to life, and ideals of charity, tolerance and loving-kindness. Situated in the heart of the Southeast Asian mainland, Thailand covers an area of 513,115 square kilometers. It is bordered by Laos to the northeast, Myanmar to the north and west, Cambodia to the east, and Malaysia to the south. The Thais, most historians believe, began migrating from southern China in the early part of the Christian era. At first they formed a number of city-states in the northern part of what is present-day Thailand, in places like Chiang Saen, Chiang Rai and Chiang Mai, but these were never strong enough to exert much influence outside the immediate region. Gradually the Thais migrated further south to the broad and fertile central plains, and expanded their dominance over nearly the entire Indochina Peninsula. Contradictory as it may seem, however, recent archaeological discoveries around the northeast hamlet of Ban Chiang suggest that the world�s oldest Bronze Age civilization was flourishing in Thailand some 5,000 years ago. 4) the South, or Southern Isthmus. The North is a mountainous region characterized by natural forests, ridges, and deep, narrow, alluvial valleys. 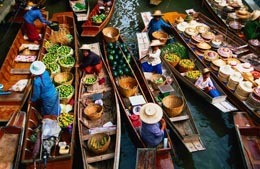 Central Thailand, the basin of the Chao Phraya River, is a lush, fertile valley. It is the richest and most extensive rice-producing area in the country and has often been called the �Rice Bowl of Asia�. Bangkok, the capital of Thailand, is located in this region. The Northeastern region, or Korat Plateau, is an arid region characterized by a rolling surface and undulating hills. Harsh climatic conditions often result in this region being subjected to floods and droughts. Thailand is a warm and rather humid tropical country. The climate is monsoonal, marked by a pronounced rainy season lasting from about May to September and a relatively dry season for the remainder of the year. Temperatures are highest in March and April and lowest in December and January. The average temperature is 23.7 to 32.5 degrees Celsius. 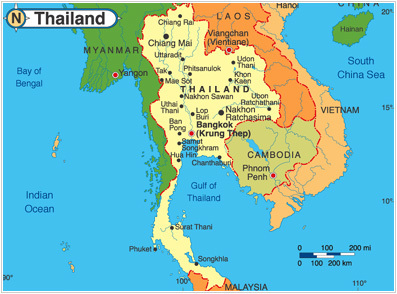 The population of Thailand is approximately 63 million (end 2002). The most important ethic minority is Chinese. Though the great majority of Thailand�s 63 million people are ethnically Thai and Buddhist, the country has a substantial number of minority groups who have historically lived together in harmony. Of these, the Chinese are perhaps the most numerous (particularly in urban areas), though they have become so thoroughly assimilated it would be difficult to isolate them as a distinct group. Similarly, while there are Lao and Khmer groups in the Northeast and East, nearly all regard themselves as Thai, culturally as well as by nationality. More clearly defined as an ethnic group are the Muslims, who are mainly concentrated in the southern provinces, and assorted hill tribes who live in the far North; there are also sizeable communities of Hindus and Sikhs in large cities like Bangkok. Some 80 percent of all Thais are connected in some way with agriculture, which, in varying degrees, influences and is influenced by the religious ceremonies and festivals that make Thailand such a distinctive country. The 5th International Conference on Advances in Information Technology, Bangkok, Thailand ©2012 by School of Information Technology, King Mongkut's University of Technology Thonburi.